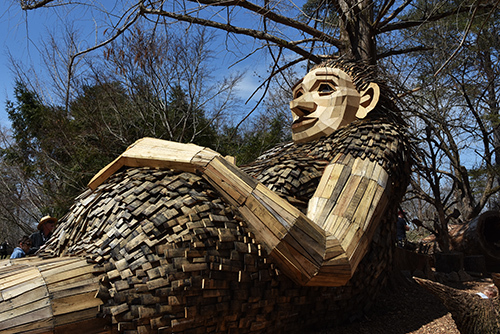 Fe Fi Fo Fum! 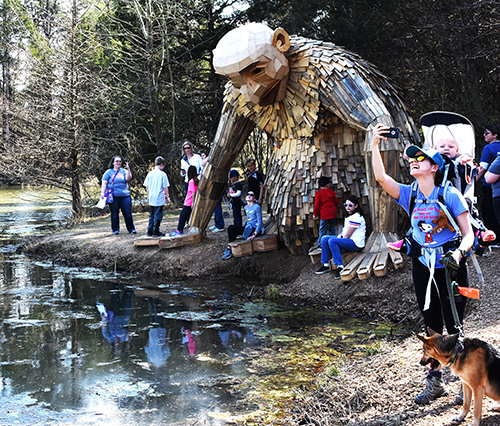 There’s a family of Giants living in Bernheim Forest! 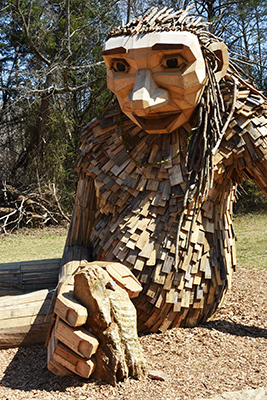 Bernheim Forest is a nature preserve and arboretum just south of Louisville. 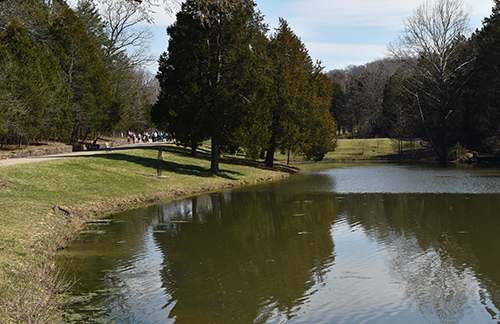 The park has over 16,000 acres donated by German immigrant Isaac Bernheim in 1929, and dedicated to the enjoyment of nature. 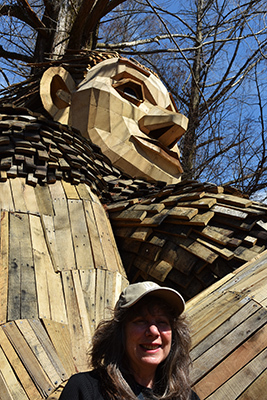 This spring Danish artist Thomas Dambo created a family of three Forest Giants at Bernheim. 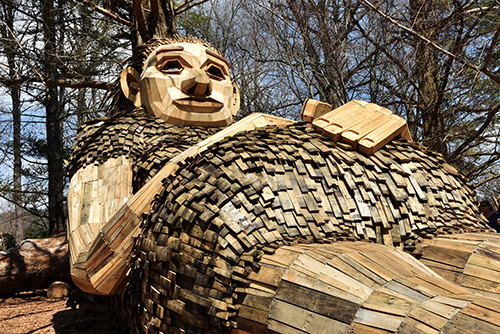 All the materials were locally sourced and the Giants will live here for several years. 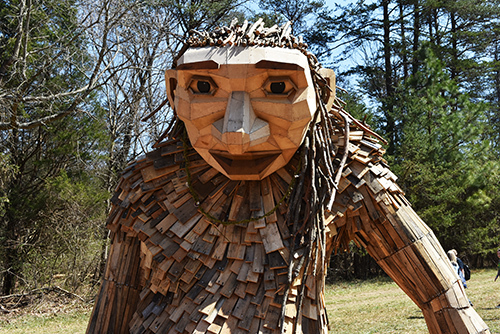 Mama Loumari is the matriarch of the Giant Clan and she resides in a lair deep within the forest. 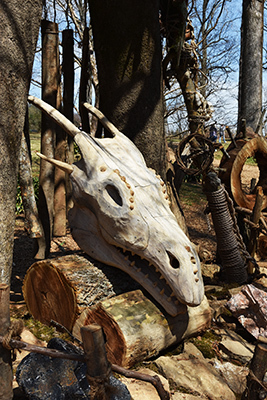 Her kitchen includes big baskets of pine cones and sweet gum balls, a throne made of logs, and an ancient dragon skull. We found daughter Little Elina across the prairie grass field where she was constructing a stone play house. Little Elina wore a rock bracelet and daisy chain necklace and seemed ready for a party. Big Brother Little Nis was fishing down by the pond, or maybe just staring at his reflection. 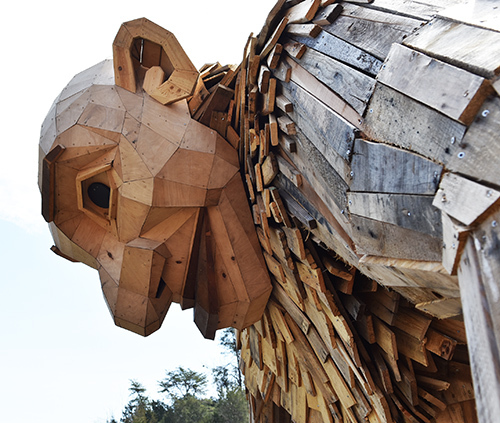 He seemed preoccupied and undisturbed by all the people gathered around him. 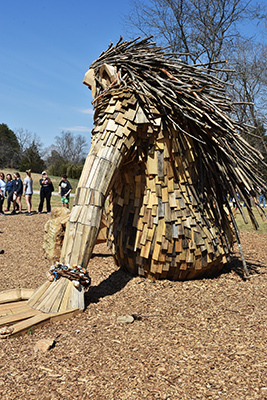 We picked a sunny day on a random Thursday to visit the Giants at Bernheim, not realizing that it was spring break for the elementary schools. 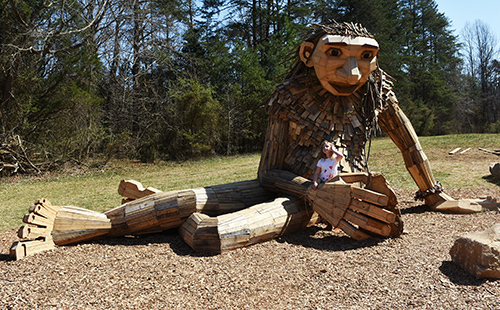 Seemed like all the kids within two counties were there, and we ambled along with the crowds to see the Forest Giants. 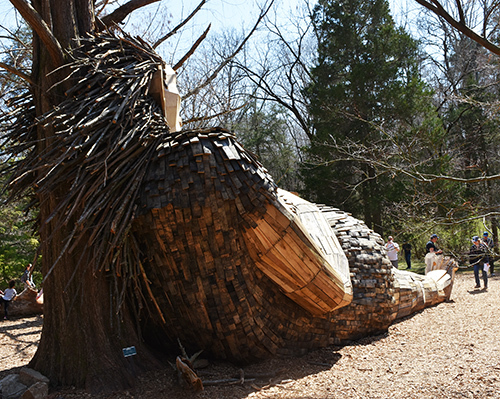 Even before the giants took up residence, Bernheim has been one of our favorite parks to visit. 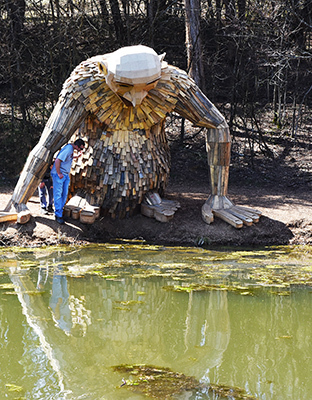 There’s multiple ponds, shady trails, and sculptures hidden along the many walking paths. 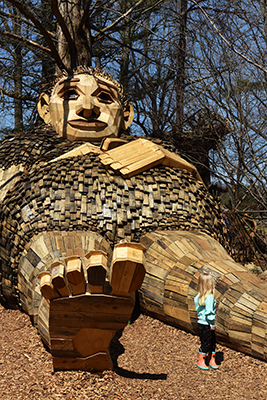 You’ve got some time to visit the Giants at Bernheim. They’ve settled nicely into their new home and will be lollygagging in the forest for a good while. 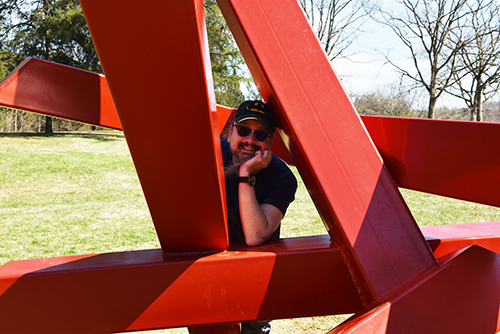 Fe Fi Fo – FUN! I can’t wait to see them! Thanks Richie! Oh, yes! Bring the grandkids! How fun, thank for sharing Richie!